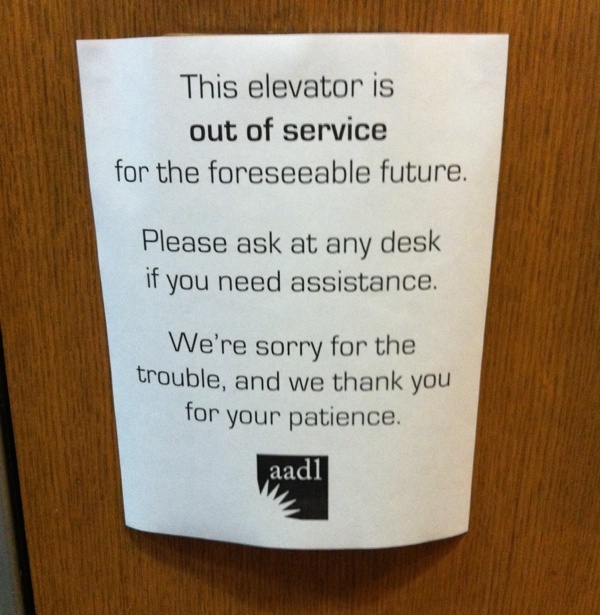 The Ann Arbor District Library’s downtown building at 343 S. Fifth Ave. will be closed indefinitely starting Thursday, Aug. 14 for repair of the public elevator. A $62,800 contract has been approved with Black & Veatch Ltd. covering a water & wastewater system capital cost recovery study for the city of Ann Arbor. The city council’s action came at its June 16, 2014 meeting. Background to this contract was a June 3, 2013 city council action to change the calculation of the water and sanitary improvement charges for properties connecting to city water mains or sanitary sewers – but only for a two-year period, from July 1, 2013, through June 30, 2015. The Ann Arbor city council has passed a resolution that asks the city planning commission to remove a “reskinning” project for the city hall building from the capital improvements plan (CIP) for FY 2017 and FY 2018. The vote came at the council’s June 2, 2014 meeting, over dissent from Margie Teall (Ward 4). The item had been postponed from the council’s May 19, 2014 meeting. 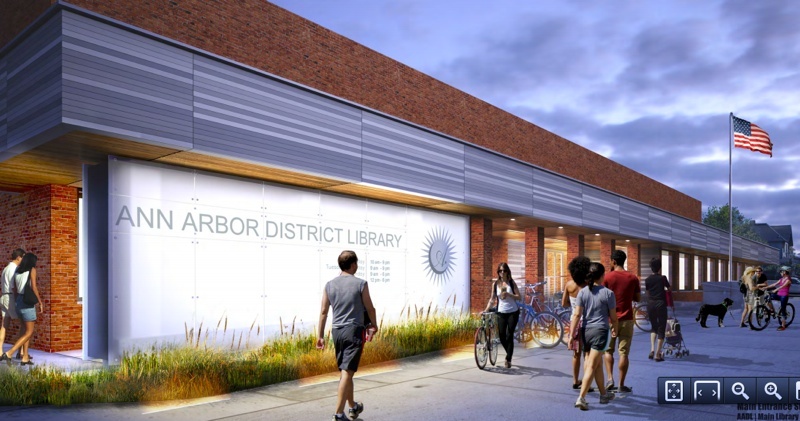 The Ann Arbor District Library board has authorized the library director to negotiate with O’Neal Construction Inc. for work related to the downtown library entrance. 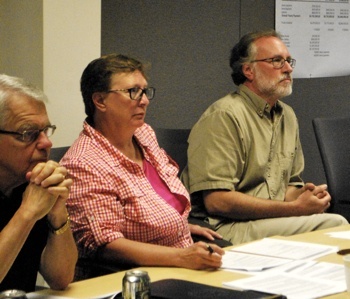 The action came at the board’s May 19, 2014 meeting. O’Neal would be contracted to provide construction management services. This is the next step in a process that began several months ago. 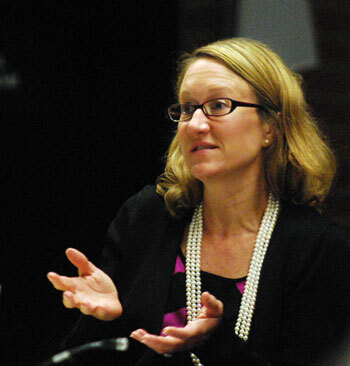 At the board’s April 21, 2014 meeting, the board had authorized the library director, Josie Parker, to hire a construction manager for the project. Board members also allocated $18,580 from the fund balance to pay InForm Studio for construction documents. InForm Studio, the architecture firm that previously designed AADL’s Traverwood branch, gave an update on the process at that same meeting. 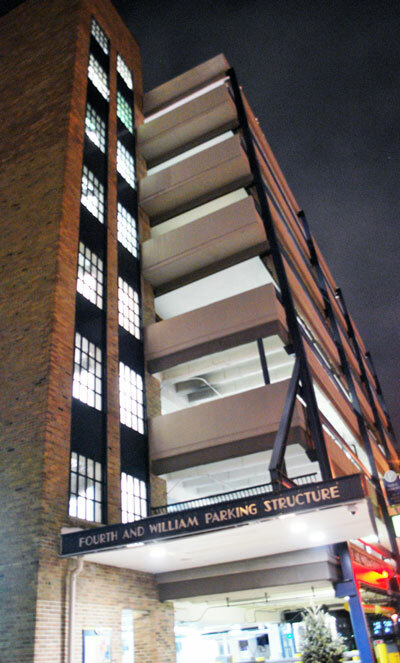 The Fourth & William parking structure in downtown Ann Arbor could undergo substantial renovations as a result of Ann Arbor Downtown Development Authority action taken at the board’s May 7, 2014 meeting. 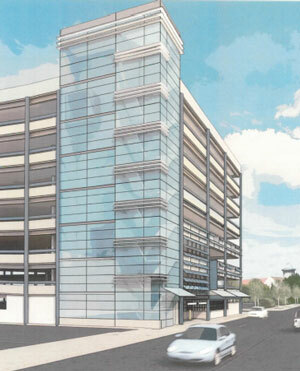 Image from preliminary drawings by the Carl Walker design team for renovated southwest elevator and stair tower for the Fourth & William parking structure. Contracts related to Ann Arbor’s annual sidewalk maintenance and repair program, as well as for the annual street resurfacing program, have been approved in action taken by the city council at its April 7, 2014 meeting. 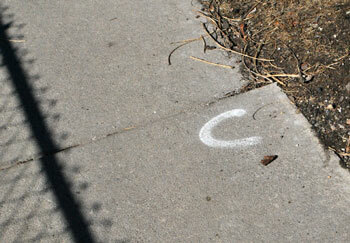 A sidewalk marked with a “C” – which indicates that it needs to be cut flush – on Fifth Avenue south of William Street. Ann Arbor District Library board meeting (Feb. 17, 2014): Work on a significant redesign to the front entrance of the downtown Ann Arbor library is moving forward, following action this month by the AADL board. A vote to continue with the project followed a presentation by Cory Lavigne of InForm Studio, the architecture firm that previously designed AADL’s Traverwood branch. A final design will likely be brought forward for approval at the board’s April 21 meeting, after a public forum in mid-March. Update: The forum is scheduled for Thursday, March 13 at 5:30 p.m. at the downtown building. The entrance would continue to be oriented to South Fifth Avenue, with new doors into the building. The plan described by Lavigne includes replacing the existing teal strip that wraps around the front of the building – above the doors and windows – with a “concrete skin” panel. Wood paneling would be used in the ceiling of the outside walkway adjacent to the building. Sloping entry walkways would be located on the north side from the Library Lane parking structure and on the south side from William Street, with steps in front leading to South Fifth Avenue. Additional elements include landscaping, a bench, handrails and other features that visually link the library to the adjacent city-owned Library Lane. The north side of the front facade, closest to Library Lane, would also include a large, translucent sign – made of glass or cast resin – that would be placed between existing brick columns, creating a screen along part of the walkway on that side of the building. 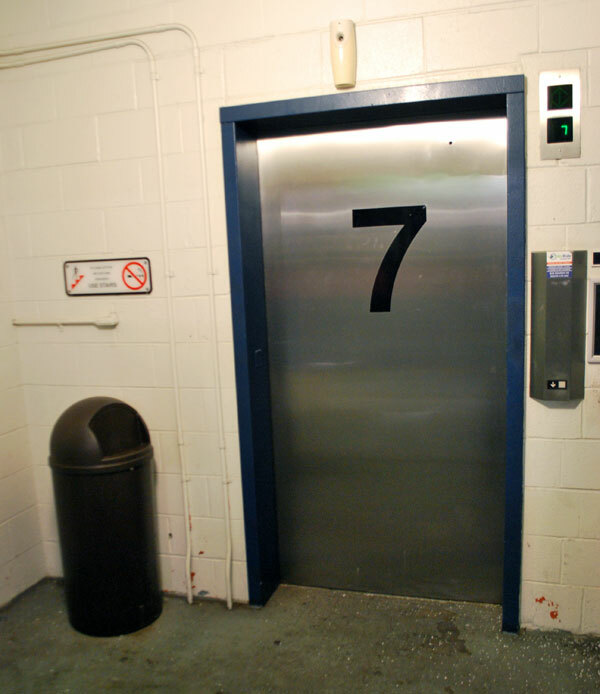 The sign would be lit from the inside, with additional lighting along the walkway, to create a glowing effect. 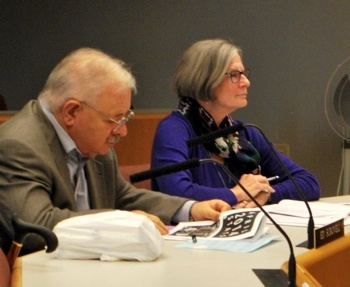 It was that sign element that drew some criticism and concern at the board’s Feb. 17 meeting, primarily from Ed Surovell. He cautioned against creating any kind of shelter, saying it would simply be “an inviting nuisance.” AADL director Josie Parker acknowledged the concern, saying that she had discussed the issue with the library’s security staff as well. She told the board that no matter how the area is designed, security issues will always be a factor and would be handled as they are now, by security staff. In other action at the board meeting, trustees approved revisions to more than a dozen sections of the AADL policy manual, and voted to create a new committee to help develop the next strategic plan, for 2015-2020. 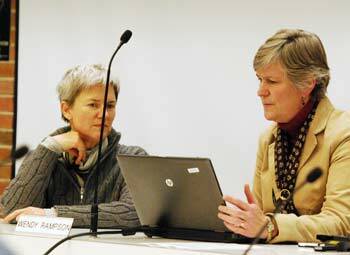 That planning effort had been the focus of a Feb. 3, 2014 board retreat. Board members also got a brief update on the agreement for a new bike share program called ArborBike, which trustees will likely be asked to approve at their March 17 meeting. It relates to a bike station that will be located on the northern end of the downtown library’s property. 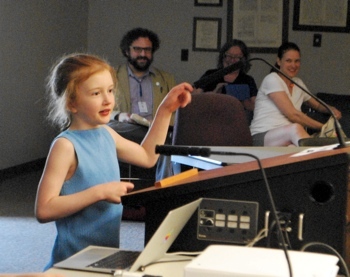 During her director’s report, Josie Parker told the board that the downtown library will be a site for the Living Lab Initiative, a project funded by the National Science Foundation. AADL will be the first public library to be involved in this project, and researchers will be working in the youth department through the end of September. 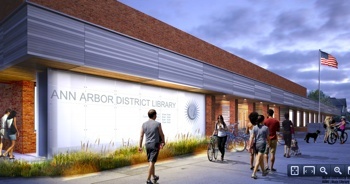 Plans for a major redesign to the exterior front entrance of the Ann Arbor District Library’s downtown building at 343 S. Fifth Ave. will move forward, following approval by the AADL board at its Feb. 17, 2014 meeting. 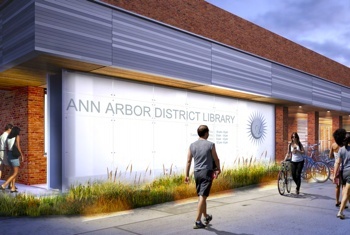 Rendering of new entrance design for the downtown location of the Ann Arbor District Library. The vote followed a presentation of the redesign by Cory Lavigne of InForm Studio, which is handling the project. The architecture firm designed AADL’s Traverwood branch. A final design will likely be brought forward for approval at the board’s April meeting, following a public forum in mid-March. 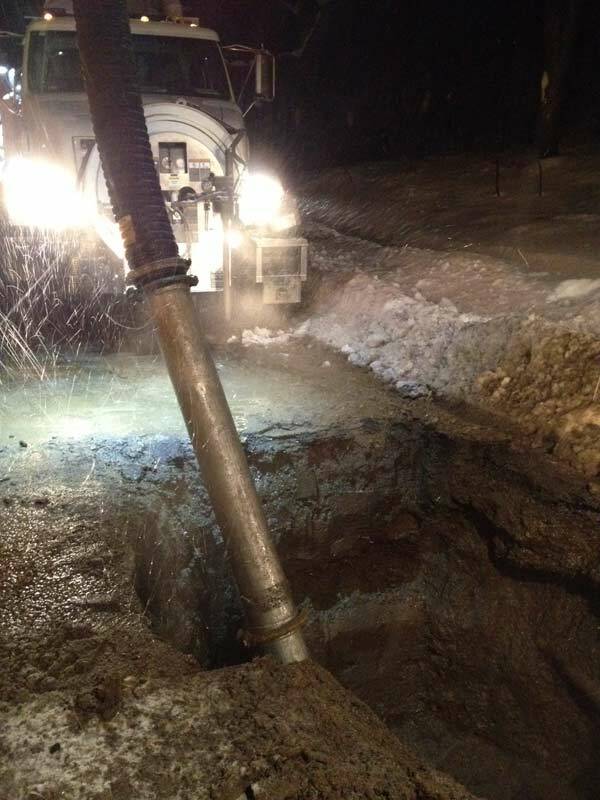 Two infrastructure projects – in Dexter Township and Freedom Township – were supported with actions by the Washtenaw County board of commissioners at its Dec. 4, 2013 meeting. New striping on Broadway in north Ann Arbor. Cross-lot walkways in Ann Arbor will now be treated as “sidewalks” from the perspective of the city’s sidewalk repair millage. Even though the millage funds can now be used to repair the walkways, owners of property adjacent to cross-lot walkways will not bear responsibility for snow removal in the winter. Cross-lot walkways include those that connect streets to parks or school property, or connect two parallel streets. For typical sidewalks along the side of streets, Ann Arbor’s ordinance requires the adjoining property owner to take responsibility for snow removal. That’s unchanged by the ordinance revision on cross-lot walkways. The council’s final approval of the ordinance change came at its Oct. 21 meeting. The Washtenaw County board of commissioners has taken an initial vote to approve participation in Pittsfield Township’s State Street corridor improvement authority (CIA). The vote, taken after about a 90-minute debate at the board’s Oct. 16, 2013 meeting, was 8 to 1, with dissent from Dan Smith (R-District 2). Cross-lot walkways that aren’t located on the side of a street will likely be defined as “sidewalks” in the city of Ann Arbor – based on the initial approval of an ordinance change by the Ann Arbor city council on Oct. 7, 2013. Elements of the ordinance change would: (1) allow such cross-lot paths to be repaired with funds from the city’s sidewalk repair millage; and (2) not trigger the winter maintenance requirement for adjacent property owners.